Michael has a new girlfriend and has just bought the apartment of his dreams. It seems that his life should be perfect. Little does he know that his hell is just beginning. In Fulfillment Bradshaw tackles the question: what makes us happy? FULFILLMENT will be directed by Ethan McSweeny and features Otoja Abit, Gbenga Akinnagbe, Jeff Biehl, Christian Conn, Denny Dillon, Susannah Flood, and Peter McCabe. 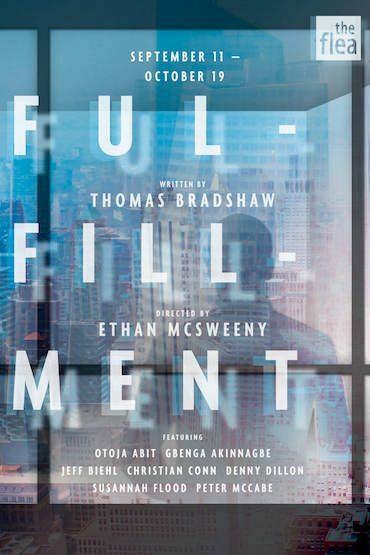 FULFILLMENT is a co-world premiere with American Theater Company in Chicago, where it opens under McSweeny’s direction in November. THOMAS BRADSHAW’s play Carlyle will premiere at The Goodman Theatre as part of their 2015-16 season. His other plays include Intimacy and Burning (New Group); Mary (Goodman Theatre) Job and Dawn (Flea Theater); The Bereaved (Crowded Fire, Partial Comfort and the State Theater of Bielefeld in Germany); Southern Promises (PS122) and many more. He was the recipient of a 2009 Guggenheim Fellowship, the 2010 Prince Prize, and a 2012 award from the Foundation for Contemporary Arts. Mr. Bradshaw has been featured as one of Time Out New York’s 10 playwrights to watch and was named “Best Provocative Playwright” by the Village Voice. Mr. Bradshaw received his MFA from Mac Wellman’s playwriting program and he is an Associate Professor at Northwestern University. ETHAN McSWEENY (Director) is based in Brooklyn, New York. He was born in Washington, DC. His twenty year career as a director of new plays, musicals, operas, and revivals has taken him all over the world, most recently to Dublin, Ireland where his production of Brian Friel’s adapatation of Turgenev’s A Month in the Countryis running at the Gate Theatre until the end of August. More information is at ethanmcsweeny.com.